Maptek PerfectDig has been recognised at South Australia and the Northern Territory’s premier Information and Communications Technology (ICT) awards show. 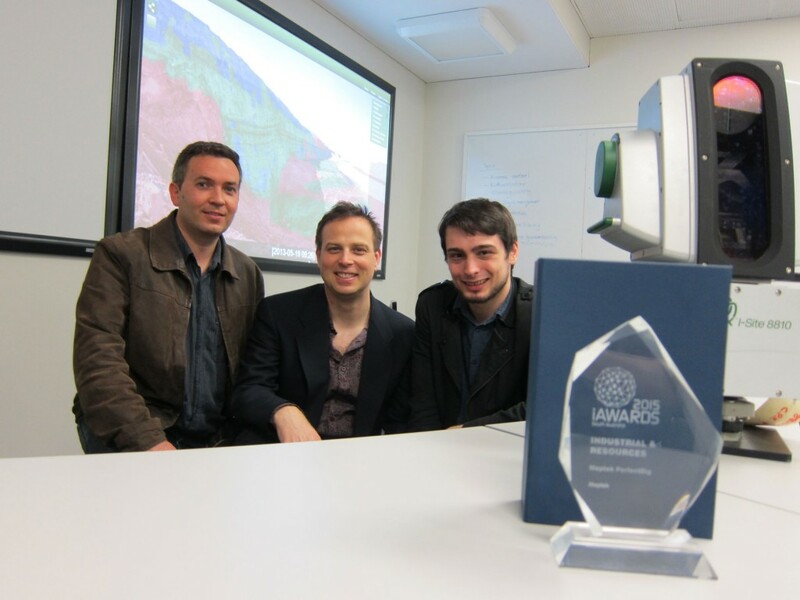 PerfectDig, which enables rapid mine design conformance analysis by comparing enhanced photographs to 3D design information, won SA’s Industrial and Resources category of the Australia Information Industry Association (AIIA) iAwards. The award was presented at a gala lunch at the Adelaide Convention Centre today (Thursday, June 11). PerfectDig team leader Anthony Gibbs and colleagues Matt Harris and Peter Iannella have been developing the product at the Maptek Adelaide office in Glenside for nearly three years. Maptek PerfectDig team members Matt Harris, Anthony Gibbs and Peter Iannella. Mr Gibbs, a senior software engineer, said the team was delighted to win the award. ‘It’s great to be recognised by your peers in the industry,’ he said. He said there was nothing else like PerfectDig on the market and customers were ‘blown away’ when they saw demonstrations. ‘It’s very innovative in the field. Maptek Managing Director Peter Johnson was proud of the team’s work. ‘It shows our commitment to innovation is paying dividends,’ Mr Johnson said. The iAwards National event will take place in Melbourne on August 25-27.